Just Rewards? Just Dessert. Just a Thought. I’m paying it forward. Or something. Over the last few months, I’ve been the grateful recipient of several favours done to me by consummate professionals. They are the reason that this blog looks and functions as well as it does and the real reason that I have any sort of a public image at all. These were not simple little things to do. They took time, thought and some effort. Both were very elegant gestures. I can build a persona, sure. They fleshed it out for me. And then you all come along and read me and, better still, engage! Comments, encouragements, corrections, it is all collectively wonderful. Yes, I am very grateful. So I’m doing a favour for a friend who is launching her own business. And I am enjoying myself immensely. Doing the same sort of thing for free that once would have bankrolled a new suit feels pretty good. I hope that it’s useful to her. But that also means I’ve got some work to do chop-chop. And that has prevented me from deep and meaningful reflection on elegance as it relates to our everyday lives. Yes, I’ve got some work ahead of me on all fronts. And you know what I like to do after I’ve worked very hard? Reward myself. I bet you do, too. I give to you THE secret to brilliant store-bought sorbet. A splash — just a dash — of vodka to citrus based ones. A splash of white rum to other fruit based sorbets. As long as you’re using a primary ingredient of a good cocktail, why not serve your dessert in a cocktail glass? Garnish with fresh sprig of mint for a very easy and very elegant summer’s night dessert. Back with more after this brief commercial break. 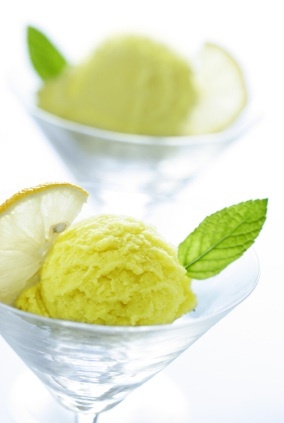 This entry was posted in Entertaining and tagged lemon ice, recipes, summer. Bookmark the permalink. 7 Responses to Just Rewards? Just Dessert. Just a Thought. What a brilliant idea! Thank you for posting. I happen to have mango sorbet and rum on hand. Dessert is planned. YUM!!! A bit of lemon sorbet in my nice new bowls, a dash of limon vodka and a sprig o’mint! I love the idea of pay it forward and try to practice it, although this big favour of having a house guest for three weeks has tried every bit of my patience. The woman’s an MD and was “raised by wolves” in the wilds of North Dakota – NO MANNERS AT ALL!!! At a lovely restaurant last night, she whipped out the toothbrush to dry-brush her teeth at the table. Thanks LuLou, one good turn.. your brussel sprouts were delicious. Fairfax! Thanks for the “revolted yet riveted” laugh…. yikes! Stay soignée. In the Alsace, sorbet was served with “schnapps” and it was so delightful. Life is uncertain, have dessert first! Mrs. PvE, and just saying “schnapps, bitte” makes me smile…. Thank you Michele! It is a very refreshing and stimulating dessert. I mentioned another in today’s post: lemon and sugar crêpes.